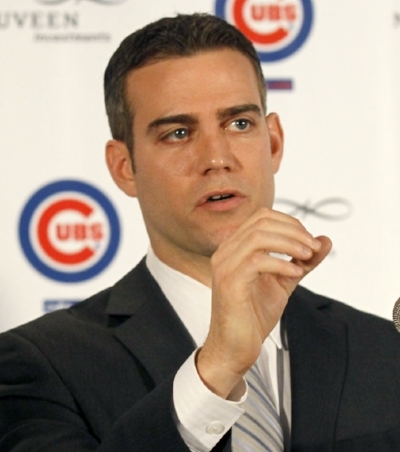 Theo Epstein Admits, "Even I Couldn't Get The Red Bulls A Championship"
CHICAGO - In a candid interview with Chicago Cubs president of baseball operations Theo Epstien, the World Series winning general manager of both the Red Sox and the Chicago Cubs admitted that even he couldn't get the New York Red Bulls a championship in a collection of remarks on Monday morning. "Bradley Wright Phillips is great but he is no Aroldis Chapman." "I broke the streak for both the Cubs and the Red Sox, but I don't think anyone is going to be able to break the curse on the Red Bulls," stated Epstein to The Nutmeg News. "There's some kind of hoodoo, upon voodoo, upon that thing that they do that is just going to be impossible to crack." Reportedly, Epstein eyed the New York Red Bulls as his next vanity project, but quickly realized that the stuff that haunts them is stronger than Bill Buckner and a Billy Goat. "They don't say, 'that's so metro,' for no reason. With the salary cap and rule restrictions in place from the league you would have to be clinically insane to think that you could pull this off." The Nutmeg News will have more on this as Red Bull prepare for a championship..... NEXT year.